It is a generally accepted notion that options are good. Imagine you are ordering from Blake’s Lotaburger—sometimes you just want a simple Itsa Burger and other times you want the Lota Burger with Green Chile and Cheese upgraded to a meal—or something in between. And this rings true for checking accounts. A checking account is a necessity. Paying reoccurring bills, using debit cards, grabbing and going from ATMs are all a part of everyday living. Even sending money via your Smartphone to a friend is becoming more and more commonplace. You may need a simple no frills account or you may desire an account that lets you do all your bill paying, has an awesome mobile application, gives you the ability to earn interest, and can access abundant ATMs. So find a checking account that suits your needs and doesn’t charge you an arm and a leg to do so. Take this information to heart—according to the Consumer Financial Protection Bureau, the average overdraft fee runs about $34—and can be charged several times a day. Eek! So let’s delve a little deeper into what makes a checking account great—and see how State ECU stacks up against some of other financial institutions. FEES—You really don’t want to have to pay money to stash and utilize your own money! So avoid accounts with monthly maintenance fees and understand the gotcha fees that you may encounter. OVERDRAFT OPTIONS—Yes this can be listed under fees, but overdraft policies and fees need to be evaluated on their own. PERKS—If perks are an option, make sure they are something that you will use and enjoy. STATE ECU gives members a variety of checking accounts. The basic Regular Checking account features no monthly fee, no minimum balance, unlimited check writing, access to a major network of ATMs through the Coop Shared Branching Network and CU Anytime, and free mobile and online services. It does not come with interest or rewards but is intended to be “no frills.” For a more perky account perfect for savers, the Free Kasasa Cash checking account comes with 2.05% APY on balances up to $25,000 (and .065% for balances over $25k) and also has no monthly service fee, no minimum balance, unlimited check writing, free online and mobile services, and access to plenty of ATMs—even a $25 monthly refund for any domestic ATM fees incurred. Earning your reward is easy enough to do via a monthly direct deposit, receiving e-statements, making 10 debits in one month, and enrolling in online banking. And if there is a month that you don’t earn the reward through qualifications, you still earn the base minimum dividend amount (currently 0.05%) and incur no fee. The Free Kasasa Cash Back checking account is perfect for shoppers and rewards you with 3.00% cash back on debit purchases monthly (earned on up to $200 purchases monthly) with all the other features in the Kasasa Cash account listed above (except dividend earnings). Similar qualifications apply to earn reward. For members who groove to a different beat, there is the Kasasa Tunes checking account that rewards account holders with $5 in refunds for iTunes, Amazon, Google Play, or Pandora monthly—qualifications apply. In terms of fees, STATE ECU’s nonsufficient funds fee is much lower than the national average at $25 (an overdraft coverage fee is the same) and there are no monthly maintenance fees on any of its checking accounts. If members can’t locate an ATM in CU Anytime network or Coop Shared Branch network, the outside ATM fee is $1.50 with Kasasa accounts. Now let’s examine the checking accounts available at Wells Fargo. Its Everyday Checking charges a $10 monthly fee which can be avoided with 10 or more posted debits, a qualifying monthly direct deposit more than $500, or $1,500 daily balance. (That balance seems a little high for a “no frills” type of account.) The next step up to Preferred Checking comes with a $15 monthly fee—that can be avoided with $10,000 in deposits, direct deposit of more than $1,500, or mortgage. If you jump up to its Portfolio Checking, you then must maintain $25,000 in minimum deposits to avoid a $30 monthly fee. The interest on Preferred and Portfolio accounts is pretty measly—just 0.01% up to $4,999; and .05% over $5,000. Well Fargo’s perks seem pretty standard with mobile banking, debit cards, etc. And customers don’t get reimbursed for ATM fees incurred outside of the Wells Fargo system unless they pony up to the Portfolio Checking tier. In terms of fees Wells Fargo is on board with the national average for nonsufficient funds at $35 per occurrence. 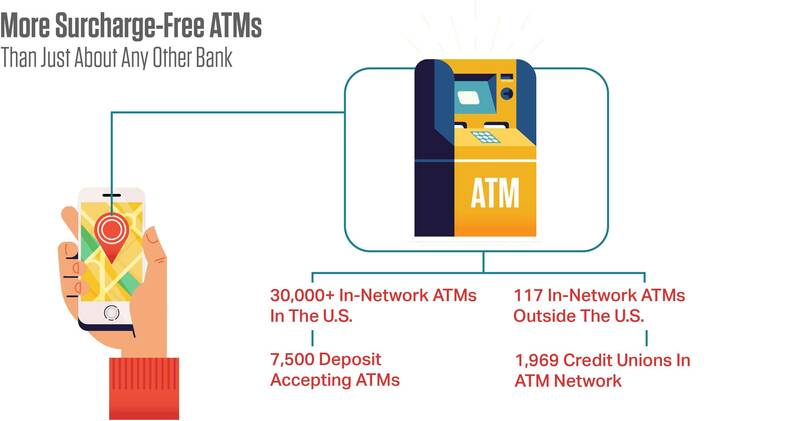 In addition, customers incur a $2.50 ATM withdrawal fee from non-Wells Fargo ATMs, which can only be avoided with $25,000 in minimum deposits. The bank’s policy on overdraft protection transfer fee was a challenge to find in its 44-page PDF on fees. However they do have a reasonable overdraft transfer fee of $12.50 if the funds can be pulled from an alternative account source to cover the transaction. Chase offers three levels of savings. Chase Total Checking is its basic account which incurs a $12 monthly fee that can be waived with a monthly $500 direct deposit, $1,500 monthly balance, or $5,000 balance across multiple accounts. It comes with the standard checking features and has no interest associated with the account. The Chase Premiere Plus Checking account costs $25 per month unless you have $15,000 in account balances with Chase or a Chase mortgage. It does have a few perks such as four ATM fees waived per statement cycle at non Chase ATMs but a very low interest rate of 0.01%. The Chase Sapphire Checking account will also cost you $25 per month unless you have an astonishing $75,000 in eligible deposits and investments with Chase. Its perks include waived ATM fees, waived wire transfer fees, waived insufficient funds fees (limits apply), and increased ATM limits. It also has a very low interest rate of 0.01%. Chase’s insufficient funds fee is $34. It also has an extended overdraft fee of $15 that gets charged each time the account is overdrawn five or more consecutive business days. For non Chase ATM withdrawals, customers are charged $2.50. Bear with me while I summarize the checking accounts at U.S. Bank. First, there were six types of accounts, and each seemed to get a little more confusing. Its basic checking account is the Easy Checking account. Again the standard features apply here. The monthly maintenance fee is $6.95 which can be avoided by an average monthly direct deposit of $1,000 or account balance of $1,500. If you step up to Silver Checking you need to also have a U.S. Bank savings account and either a monthly direct deposit of $1,000 or average balance of $1,500 to avoid the $6.95 monthly maintenance charge. This also is a no interest account, so not sure of what advantages you get here. There is information that pushes you to a money market account as well as a savings incentive if you meet a certain savings goal in your savings account. But not much information that explains why this is a good checking account. Let’s look at one more U.S Bank account, the Platinum Checking account. This one comes with a hefty $24.95 monthly fee that can be avoided by $25,000 in combined personal deposits, a credit balance with U.S. Bank, or investment or personal banking relationships with U.S. Bank. Among the perks it states a “high interest rate” – which in reality is only 0.01%. It does offer waived non U.S. Bank ATM fees, no-fee overdraft protection transfers, free paper statements and copies of checks, and free family member checking accounts (if customer is co-owner). The strangest perk was listed as free mobile check deposits, which as far as I can see comes pretty standard with every checking account on the market. And then it added, “…and there’s no fee for standard deposits to your Platinum Checking account.” All I can say is,” Huh?” U.S. Bank’s non sufficient funds fee is $36 and it also has a whooping $36 extended overdraft fee if a balance remains negative for seven consecutive days. Its overdraft protection transfer fee is $12.50 per day. So when you are shopping around for a checking account, be sure to do your homework. And if an account seems really confusing, it may be a clear sign to avoid that particular account. You want your checking account to be easy to understand and easy to use—with no unnecessary fees or headaches.